My apologies to Philip, who wrote recently that he’s been waiting for my review of this Camps de Luca suit. And to anyone else. The suit was completed a few months ago and we managed to take some photographs last month. But books, polos and events have conspired to get in the way since then. 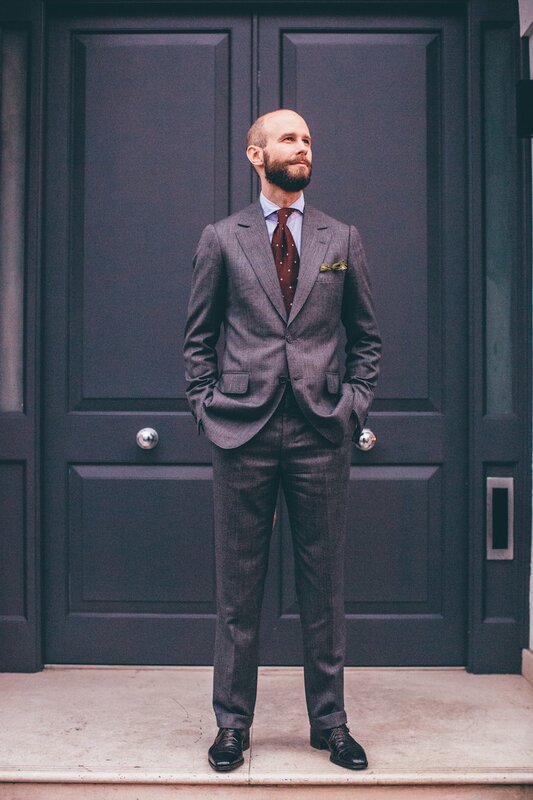 This, then, my 13oz grey worsted single-breasted suit from Camps de Luca, Paris. For anyone that’s not familiar with the French tailors, Camps shares many of the attributes of fellow Parisians Cifonelli and Smalto: lightweight canvas and shoulder padding; clean chest (cut close, no drape); pronounced shoulder roping; and absolutely superb finishing. Camps is also known for its fish-mouth lapels. As you can see in the top image, the lapel is angled up slightly after it meets the collar, closing off that space and creating quite a strong horizontal line. 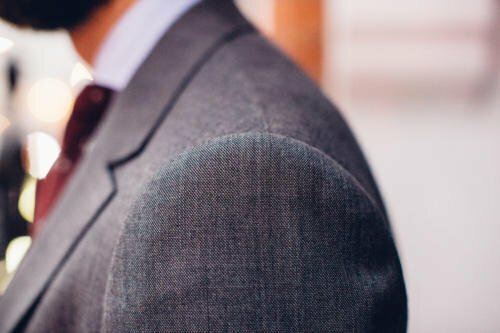 After the shoulders, this meeting of collar and lapel (the gorge) is one of the most important aspects in the style of a suit, and makes a distinct impact. So what do I think of it on my first Camps suit? I like the way it adds subtle personality, without resorting to the silliness of multi-angled pockets or horizontal stripes. But it also hasn’t won me over; I’m not about to ask any other tailor to cut my lapel in a similar way. Looking at those shoulders, it is interesting how far around the sleevehead Camps puts it wadding to rope the shoulder. Most only put in roping at the top, creating that focal point at the end of the shoulder that gives width to the physique. But Camps continues the roping further round, front and back, emphasising the work and leading to an impression of the shoulder almost being separated from the rest of the jacket. 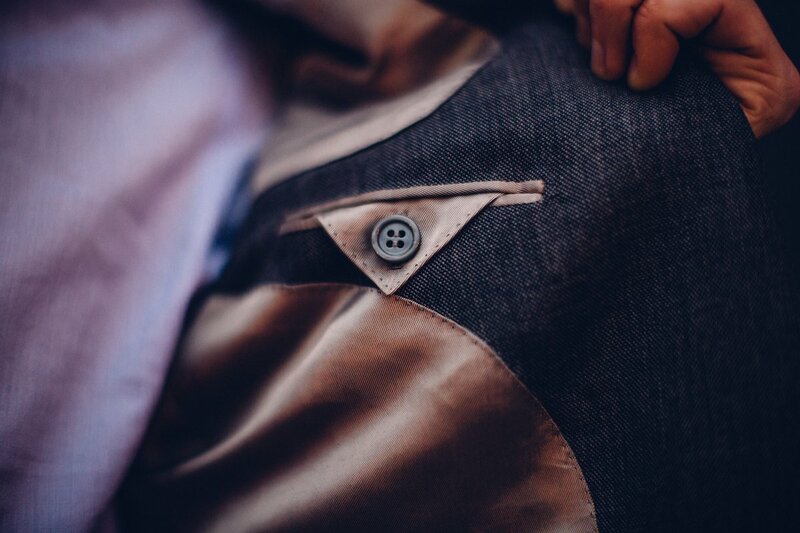 Another distinctive aspect of a Camps suit is the folding of the cloth inside the vents. The normally hard line of the side vent is softened by having both sides butting up against each other. I like this principally because it prevents any chance of the seat being exposed when you put your hands in your pockets (which I do a lot). On that point, there are several making aspects of the suit that I found fascinating – and hadn’t realised before. For example, the pocket bag in the trouser is attached to the fly on the inside. This stops the pocket bagging out too much, as it is constrained by that attachment to the fly. It is no less comfortable to use, but means the pocket keeps its shape. It is also striking that the front of the trouser is perfectly flat and smooth – yet the fastening is one of the simplest you will find. There are merely two fastening points on the waistband, one on the left and one on the right. It rather undermines the point of complicated fastenings used by the Neapolitans (and Cifonelli). I’ll post some pictures of these making aspects in a separate post, which will make them easier to illustrate and explain. As we would expect, the finishing on the suit is first class. The cloth runs all the way around each in-breast pocket, with the lining being hand-sewn down first, then top stitched for decoration. The lapel buttonhole is a small but absolutely perfect Milanese. 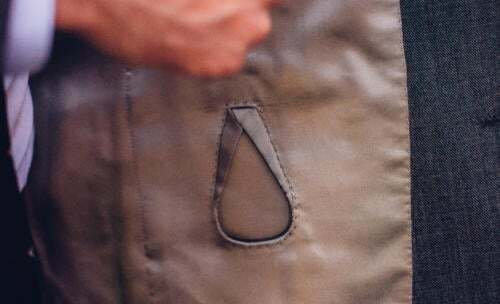 And we have the distinctive tear-shaped pocket on the inside hip of the jacket (shown above) with the Camps de Luca name above it. Although the initials under the cuff, which again is a house trade mark, aren’t quite as fine as the work elsewhere. Those in-breast pockets, by the way, are noticeably high and angled. Only Anderson & Sheppard does them quite as high, and I do like it. Wallets and phones remain in the chest area, and don’t encroach at all on the closely fitting waist. That’s one thing I would certainly ask every other tailor to replicate. Worn with a burgundy silk tie from Loro Piana, with small and refreshingly widely spaced motifs in white and blue. Deep red works with a mid-grey like this better than any other colour of suit. Handkerchief from Drake’s. The matte texture of the wool is of course a nice balance to the silk of the tie, and green is a classic colour to pair with red in such accessories, given they are complimentary colours. You can follow the discussion on Final Camps de Luca grey suit by entering your email address in the box below. You will then receive an email every time a new comment is added. These will also contain a link to a page where you can stop the alerts, and remove all of your related data from the site. Hands down one of your best suits. Clearly the best fit I’ve seen in your wardrobe. Superb! Paul, I think your Parisian bias is getting to you! For me, it is a very attractive suit, but it is also slightly lifeless. You don’t need A&S levels of drape in a suit, but a bespoke suit needs some. This has none and suffers for it. At Camps’s prices, I don’t think that A&S, Huntsman, Poole, etc., need worry too much. Agreed. Many thanks for posting, Simon. Lovely suit. Now we just need you to commission a DB from A. Caraceni and you will have covered all the leading tailors in Europe. I appreciate these reviews – find them illuminating as i am made aware of something i never quite thought of prior for instance the high angled inside breast pocket – would ask my tailor (s) to replicate this. Could you not have asked for the initials placed at the cuffs? Personally i find them very tacky. Superb suit but the roping on those shoulders! Grrr though it has to be said this is personal preference. Such a beauty! I find I connect with this house more than I do with Cifonelli and although I have yet to commission a suit with either house, I look forward with relish to when I will have suits made by Camps, which hopefully will be soon. To the details of the suit, you wrote about the length being a tad short but unfortunately there isn’t a photo that allows one to see what that is like on you – the hands in pocket thing…Enjoy your suit Simon. Very nice suit and again a review full of interesting details. To get an even better sense of the house style particularities (e.g. jacket length and openess of the foreparts) it would be great to incude a full view image where you don’t have your hands in your pockets. I guess we all like to do that a lot. Yeah, can do. It always feels so artificial – I never stand like that! A very beautiful suit. I would have gone a tad lower on the buttoning point, but that’s just personal preference. Well done. Interesting that you haven’t been fully won over yet Simon…Is it common that you find yourself warming to a cut over time? Or do you find first impressions to be pretty lasting? I would also ask which cuts (tailors) you place above Camps? Thanks for all the great posts. A coat without any chest drape can only work on skinny or athletic figures (if any). For me, it’s a fashion affectation. The full chest is one of the things that sets bespoke apart from RTW. Why does a bespoke coat have a canvassed chest? Think about it. It’s to create shape and to emphasise the width of the chest and smallness of the waist (especially where there is none!). It sculpts you. It also creates space for wallets and phones. That’s bespoke tailoring. This type of tight, drape-less cut would be highly unflattering on the average overweight businessman. Most tailors understand the importance of drape and shape in the chest and torso. I blame the fashion crowd for this new trend. Thanks Mac. Good points, although bespoke tailors vary a lot in their approach to drape over here. A&S and Huntsman have had dramatically different amounts of drape for a very long time. Yes, different amounts at A&S and Huntsman – but drape all the same. It’s basic tailoring. I don’t criticise Camps De Luca of course. There’s much to admire here. I just think that no drape at all makes you look like a sausage! (i.e. shapeless). I violently agree with Mac on this important point. The thing I love about these reviews is they save me going through the agony. My verdict on this is not bad but it would never tempt me away from A&S. The only one that does is C&M. I love their house style. I know it is very different from A&S and I think it appeals to the inner Jason King in me. Sometimes when I’m passing their shop I’m gripped with this overwhelming desire to rush in and ask them what they can do for an overweight dwarf like me. It would challenge them. I feel like we haven’t seen a suit review from you for so long ! A great classic grey with some fine roped shoulder and label details. The roped shoulder and lapel remind me of the jackets Edward Sexton likes to wear although I prefer this which is elegantly understated. On the subject of pockets why these as opposed to angled pockets or Jetted pockets ? Also, dare I mention that dirty word ….. Cost ? Finally , as per other comment , some of the points you make are best illustrated by more photos. Thanks. Edward uses a stronger rope and stronger chest – probably the biggest details. The French all have a pretty lightweight, close chest. Love the suit. I see that you’ve gone for a 13 oz. I’m currently commissioning my second bespoke suit and am torn between going for a 13 oz or 14 oz navy hopsack (between Smith Woolens Botany or Steadfast). I don’t have many suits and am looking for something that will last and hold it’s shape so am erring towards the heavier weight. What weight would you go for? Beautiful suit, Simon. Dare one ask how much it cost? £4600 (€6500). Always try to avoid thinking about it as a lump sum – better as two installments a year apart…. Brilliant Simon. Indeed, the chest is cut very close. I have a lot of issue of “Adam” magazine, (a french equivalent of Apparel arts) of 30s,40s,50s and 60s. The magazine show pictures and fashion sketch of the most famous Parisian tailors of that age ( De Luca,Camps,Creed,and many others). No one of the single breasted suits have the so called “fish mouth lapels”. So,i think that this feature is began late,in 70s or in early 80s. I don’t really agree with Mac’s point on drape. 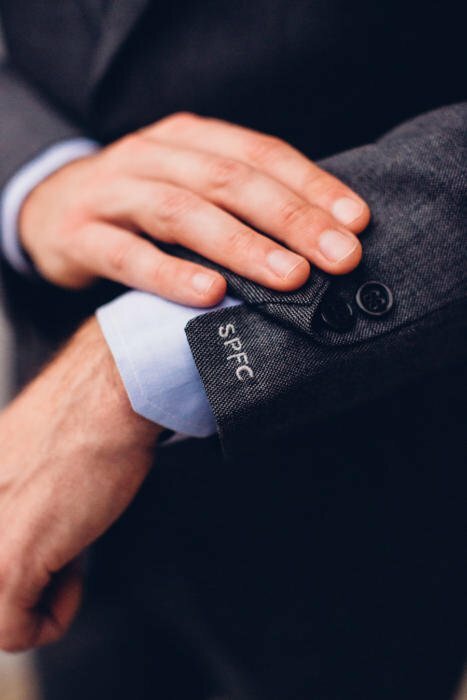 Bespoke is all about proportion and fit relative to the wearer. Tight, as in the current 007, is about fashion. Slim, soft tailoring, with or without drape ( and how much drape is not enough or too much ) can flatter no matter the wearers shape, and the structured make of some coats can equally do so. Structure can also lead to lack of fluidity in a coat, which itself can be a challenge. To my eye Simon’s CdL had enough drape to give shape to the chest without exaggerating, and doesn’t look too different from the A&S we have seen. A bit off topic: did you ever to a post abiut Graham Browne’s new coat maker facility in Essex? Would you care to identify the precise cloth? This bunch does not exist any more but it was replaced by the bunch Perennial Classic N°1564. PS – Those initials on the sleeve – oh dear! Hi Simon, love the site. Just checked with H&S. Can’t remember the number this has now changed to, but was told that if you continue to ask for 651717 from the Classic Worsted bunch, it’ll filter through to the same. One word came to mind upon finishing reading this review: nasty. Nobody is going to understand what you mean by simply saying ‘nasty’. I have no idea what that refers to. I thought it a great read. Loving everything about that suit especially the fabric. Thanks for the review Simon. More of the same please. I’m not in the habit of posting much on the Internet as I hate computers. But had to say that your cloth choice on this suit has pushed me to have a UK tailor make up something. Just got a sample from H&S, Savile Row and it looks beautiful. How would you advise someone one choosing Cifonelli or Camps？I’ve been told by someone who has had experiences with both that Cifonelli really excels with DBs and overcoats, and that for single breasted suits, Camps de Luca is a more ‘interesting’ choice, what are your thoughts? Hello, I’m planning to make a 3-piece flannel suit with DB vest and SB notched lapel jacket. Would you recommend Cifonelli for this combination? Or is Camp de Luca better? Simon, a quick question on the higher angled breast pocket. I commissioned my first bespoke (finally) yesterday with thom Sweeney. (In an almost identical cloth to this but navy from the H&S bunch) I have asked them to replicate this higher angled pocked, for the same reason as you have stated. Especially as the TS house style cuts in even closer at the waist. But is this pocket also shallower than normal? And does it angle away from the lapel towards the back of the suit or forward.? I obviosuly don’t have an example to show them so we are going to have to plan it out at the fitting. I was also thinking about a top sideways breast pocket like on a trench coat instead but didn’t know if that would work on a suit. You’re talking about the in-breast pocket, on the inside of the jacket, yes? Yes I was talking about that.the trench pocket I s not on the outside under the Lapel.In my Burberry trench I have a pocket inside high up that is “sideways loading” so you can just slide you hand in. I suspect it is similar but does not have the button. While at Camps, did you ask about their bespoke shirt offering? Not much info out there on their shirts. Hi Simon. What’s your take on wearing a DB 6 X 2 casually (as seen in your navy hopsack by Caliendo) made by Camps? I ask this in reference to their roped shoulders. Thanks. Camps de Luca and Cifonelli are widely regarded as the two premier bespoke French suit makers in the world. You have had experience of using both. In your opinion, who is the best between the two of them in terms of; style, construction, handwork, value for money and so on and so forth. I think that a lot of your readers including myself would like to know your take on this? Both houses are superb, there is pretty much nothing to pick between them in terms of fit, make, or the most important aspects of bespoke. The significant difference is really just style, and I have tended to prefer the Cifonelli shoulder and lapel, particularly DB lapel. Cifo is also a little more experimental in terms of styles and materials, although I would always go for the most conservative thing in this range they had to offer. It should be said again that Camps’ work, fit and finishing is superb, and frankly better than almost any other bespoke house in the world. I loved the suit they made for me. This is an amazing suit but I am surprised that you seem to give little thought to the cloth (quality, not colour etc). With so little quality cloth available anymore (some would say only Bateman Ogden Westminster book, SW Steadfast book, Fox LL flannels are the last, the rest being garbage (particularly the “new” minnis etc from HFW) I would have thought that when commissioning as suit at this level, careful consideration of cloth would be required. Maybe getting some worsted from London Lounge. What are your thoughts on the decline in quality of the cloth being made today? Would be really interesting to hear your thoughts on cloth quality as mentioned in my comment above. You have a unique position in this industry, and perhaps you could do some investigation in to what the quality decline is caused by? And what physical properties of the cloth (even for the same weight) has changed? Thanks. And sure, it would be an interesting thing to look into at some point. But to be honest, my opinion and experience is that these small differences in cloth are a long way down on the list of important things to consider in a suit. Even just in cloth, getting a proper weight, avoiding high super numbers, some fibres etc, are far more important. Many thanks Simon. But I’m not sure these are “small differences in cloth”. I would say it is an almost existential question, as good cloth is the foundation of any good suit. 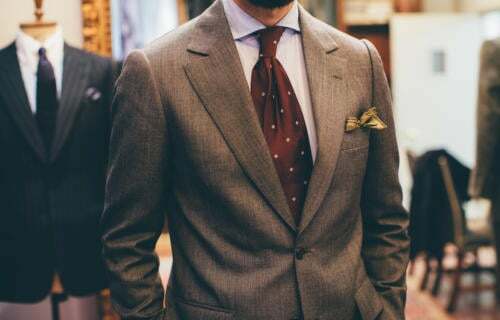 One tailor I spoke said that once those last few bunches of quality cloth are gone, he’s not really sure how he can go on as a tailor as he feels bad tailoring cloth that is not worth the craft and workmanship. I’ve personally experienced how bad HFW / Minnis has become as a suit of mine from the Classics book is, even though well cut, a true disappointment solely due to the cloth (doesn’t hold a press, wrinkles easily, no drape despite being 13oz). I love you blog, but am a bit surprised / disappointed to your attitude to cloth, as you present it to readers as not being very important which maker etc one chooses as they will all be the same. This will unfortunately only lead to even more uneducated customers and make it even easier for the cloth industry to put out sub par products. Thanks. I appreciate your point. I certainly wouldn’t say cloth is not very important, but I would say it is less important than many give it credit for – compared to the cut and structure. So many cheap tailors sell themselves purely off the fact they use Zegna or Loro Piana cloth, etc. And while there are certainly differences between the mills, as you point out, again the differences are not as much as most people assume. They think the mills are like designers, all putting out unique product, with specific aspects of the weave, design etc. But they are not – the majority overlaps. In general, I think you are taking my moderate points to extremes. Cloth, make and cut are all important foundations to a good suit. Thanks Simon. I don’t think it’s down to the mills, rather the merchants trying to cut costs by ordering inferior cloth. Have you tried London Lounge cloth or vintage H Lesser? I have, and it is beyond compare to anything I’ve found in the present day books. My point is that something has changed with the production of cloth today that somehow seems to lost drapiness / flow / ability to hold a press. A tailor told me his favorite used to be H Lesser Tropical Worsteds which was 8 – 10 od yet draped much better than much heavier cloth today. So it’s not even about weight. Hence, I think this subject would be very worthy of journalistic treatment by you. Maybe an article just starting with the simple “what has changed”. For example why was the old H Lesser Lumbs Golden Bale the legend it was while the present offering is crap? There is so little written on the subject outside of the London Lounge (which may have its own agenda), so I think you could really break some new ground here! Thanks Simon. It is this kind of journalistic treatment you to the various bespoke / craft topics you cover that keep many of following your blog loyally! A great suit and a great outfit. Could I ask if you know where I could purchase that tie – the Loro Piana website is quite brief on their tie collection and I live in Sydney, where they unfortunately don’t have a shop. Many thanks. I would like to ask between Camps de Luca and Cifonelli which one that you personally recommend to go? I’d go on style more than anything else – both are comparable in terms of fit and quality. I agree totally with all that you say about this suit the finish is the best I have observed on any suit you have worn in other features. 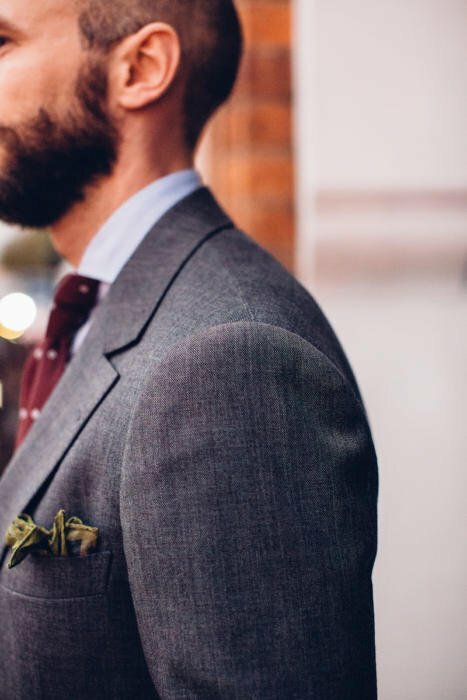 The lapel is not strictly speaking a ‘Frog Mouth’ never the less both the lapel and in particular the collar are stunning – notice the absolutely straight line on the break from the top button to the back neck. What is the fabric for this suit – and where can one get it?